Last week, Terra Dura was lucky enough to attend Austin Design Week, the first ever week long event celebrating design and art in Austin through a series of workshops, classes, and tours. One of the most intriguing was the session on Tactical Urbanism and the transformation of a parking space into a Pocket Patio. DWG, the local design firm that has been leading these projects in Austin, was kind enough to lead this workshop and tour, and we felt it was the perfect to share with you. The Pocket Patio concept isn't new, but it is new to Austin. Born in San Francisco, the idea is simple......let's reclaim the land utilized for cars and make it into something that can be used by hundreds of people a day. The execution though, is truly where all of the work comes in. 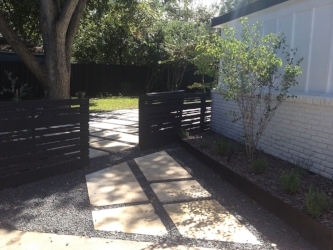 While DWG has successfully established themselves as the leader in designing and executing Pocket Patios in Austin, we believe the growth in the trend will certainly cause a number of other Landscaping companies to step forward and begin trying to establish themselves in the field as well. A Pocket Patio is essentially the reclaiming and re-purposing of a space in which the priority of that space becomes community and emphasizes interaction. So where two parking spaces outside of Royal Blue on Congress were utilized by at most 50 people a day collectively, the space is now utilized by hundreds of people daily. They gather outside to dine, enjoy their time with friends and a cup of coffee, or perhaps take a meeting outside, rather than in the office. Yes, the hustle and bustle of Congress continues as you are there, but the joys of being outside in the beautiful weather with the sun far outweighs the office lights and desks that are confining and draining. In addition, Pocket Patio design is now effecting the designs of personal patios, as seen here in Houzz. As you can see, utilizing the space is of utmost importance. By addressing the needs of the owners and looking at how and why the space will be used, or the Psychology and Sociology of the space as DWG said, you look at not only what it can be, but the who and how as well. This is great news for those living in Condos, Town homes, or just houses with smaller lots in Austin. 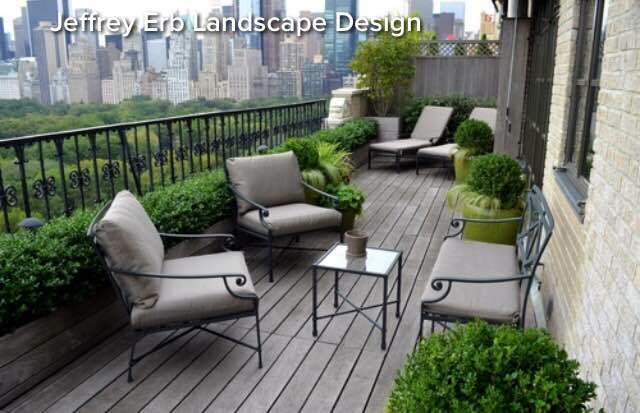 No longer are you limited to looking at your yard, patio, or balcony with sadness because, thanks to art and design inspired groups like Rebar, the design firm responsible for starting the Pocket Patio movement, and DWG, ideas and information are readily available that can be transferred to personal spaces. Houzz had a great article that we found really brought to light how these large projects can be scaled down to a personal balcony / patio in some of the larger cities. And because the patios can include permanent structures, and the permitting process for this is already established, the jobs are much easier and faster. Here you can actually see the transformation of one patio from tired and dated to a modern oasis. While this yard had permanent structures put in such as the cement wall for the garden, a true Pocket Patio, like those outside Royal Blue, must contain non-permanent structures. So how does this apply to Austin and it's growth? As the population continues to grow, the amount of land becomes more and more limited. Apartments and Condos grow taller daily, and for those that own or rent downtown, grass is hard to come by. And while the majority of these come with great views from the patios and balconies, the space is limited, and that makes tapping into the possibilities of the space hard. It truly takes a trained eye to look at a space and see what it could be, rather than what it is. Could your balcony contain a garden, seating area, and a water feature to cut down on the noise? Do you have the ability to include furniture in the design, but not give up the floral and fauna that you want? What if you wanted to add a vertical garden? And for those renting, what can be done that can be undone? The possibilities are truly endless and we are excited to see the growth and expansion of Pocket Patios and to see where this Tactical Urbanism takes Austin over the next decade. We hope you'll continue to travel with us on this journey as we not only watch, but take part in the Pocket Patio movement. Did you know that you could earn up to $1,750 in City rebates for replacing your turf grass with native plants? The City of Austin WaterWise Landscape program encourages residents to cut down on water usage (and your water bill!) by switching to drought-resistant, hardy native plant beds that support our local ecosystems and require little to no irrigation or upkeep. If you replace at least 500 square feet of your healthy grass lawn with native plantscapes, you may qualify to receive $35 per 100 square feet, up to $1750 total. Ready to get started? Click here for more information on how to apply for the City of Austin WaterWise Landscape program. There are lots of special requirements you must fulfill in order to qualify for this helpful program, but please don’t let these overwhelm you. This is our passion and specialty at Terra Dura landscapes, and we’ve taken the time to master everything you need to get the most City bucks and a landscape you love. Plant material must be installed between September 15 and November 15. Contact us now to set up a proposal for your fall application before the September 30 deadline! Fall is the perfect time to work on Landscaping- Most people assume Spring is the only time to work on your landscape, but Fall is actually much better, especially in our Texas heat. Trees and perennial plants need time to set down roots in the Fall and Winter, so they can thrive in the Spring. Trees and native plants need far less water to establish in Fall and Winter as opposed to planting in Spring and Summer. We are running a tree planting special. Pick from any of the three recommended low water large shade trees below for one flat "tree and installation" fee of $500 plus sales tax. Tree will come in 30 gallon size (approx. 8-20 feet height depending on tree type*). Please contact us to set up installation time. Planting large shade trees, like this Mexican Sycamore, are a great way to cut down on your utility bills, by planting to the southwest of your house. Is it time to install a new patio? We have great options if you are going for a "rustic Hill Country feel" or a modern patio. While many folks use the words Low Maintenance and Xeriscape interchangeably, I always like to warn my clients that it does not mean NO maintenance. Xeriscapes are low maintenance compared to a well maintained turf lawn. Xeriscapes require less water, fertilizer, and grooming in the long haul, but be prepared for battle with the weeds. The two most insidious weeds to fight are nut sedge and bermuda grass. While there are many tools for battle (hoop hoe, herbicides, or propane torch), maintaining the weeds in your xeriscape will be challenging. Terra Dura will stand with you in the great Battle of the Weeds pouring out our very own blood, sweat, and tears. We look forward to hearing from you to set up a plan to keep your home native. We specialize in xeriscape installation, but we can do it all from native plant care to landscape installation. Please contact us to set up a meeting. One free lawn maintenance service- You can take advantage of this offer when you set up a 6 month maintenance contract with Terra Dura Landscapes. We specialize in xeriscape maintenance and native plant care, but we can do it all from basic lawn care to landscape installation. Please contact us to set up a maintenance proposal meeting. Accepting maintenance contracts in the central Austin area. Maintenance contracts will range in price depending on the type of work. A maintenance contract could include weeding xeriscape areas, basic lawn service, and/or trimming plants. Now is the time to plant wildflower seed for them to come up in the spring. Check out this great native plant for your yard. While many folks use the words Low Maintenance and Xeriscape interchangeably, I always like to warn my clients that it does not mean NO maintenance. Xeriscapes are low maintenance compared to a well maintained turf lawn. Xeriscapes require less water, fertilizer, and grooming in the long haul, but be prepared for battle with the weeds. The two most insidious weeds to fight are nut sedge and bermuda grass. While there are many tools for battle (hoop hoe, herbicides, or propane torch), maintaining the weeds in your xeriscape will be challenging. Terra Dura will stand with you in the great Battle of the Weeds pouring out our very own blood, sweat, and tears. We look forward to hearing from you to set up a plan to keep your home native.